Yesterday I listed five strategies for attending Stations of the Cross with children. Today's blog post will conclude with five more. I know that some people might not agree with this concept. It certainly isn’t right for every family. But I find that it works well with my daughter, who always needs to move a lot in order to absorb and understand things. I’ve set down some rules, however, to ensure that the game doesn’t become too boisterous and detract from the prayerful experience of the stations. I purchased a beautiful set of prints from a Catholic bookstore. I put each print in different places around our house, then give my children hints on where they can find them. They must walk to the hinted location. When we have found the print, we discuss what we see in it, and what it means to us. Then we say an “Our Father,“ after which each child makes up a short prayer about the station. Sometimes we might sing a song, too. I will then give them a hint about the next location, and we will walk there and repeat the process. We do this as long as I can keep their attention. Some days we might only do four stations; other days we might be very lucky and do all fourteen! Another family prays the stations of the cross by filling a shoebox with small items that represent each station. The children then take turns taking the appropriate item out of the box before the station’s prayers are said. This link describes the items they use. Others may opt to use the Resurrection Eggs, a set of 12 plastic eggs that contain little items symbolizing Jesus’ passion and death. These are available from many Christian booksellers and Amazon.com. Some families have successfully kept their child’s attention by using a candelabra. The devotion is done in a room illuminated only by 14 candles. A simple meditation or prayer is done for each station, after which a child extinguishes a candle. (Children love doing this!) The room is completely dark after the last station. This clever use of candles, light and darkness creates a lasting impression on children and adults! 8. Break it up and do only a couple of stations each day. Although it is best to pray all the stations in one sitting, this may not be realistic with young children. Instead, consider saying one or two stations each day. It could become part of your evening prayer time. You will then cover all station in about a week. By breaking the devotion into smaller pieces, your children will retain more, too. 9. Do the online Stations with your children. This website shows photos of the Via Dolorosa in Jerusalem. 10. Provide things for your children to do during parish devotions. This link provides a printable coloring book of the Stations of the Cross. 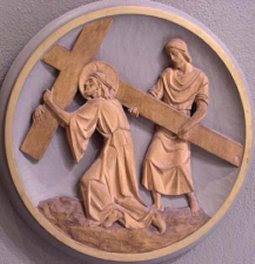 Here is a downloadable book on Stations of the Cross. In tomorrow's post, I will share additional books and other resources on Stations of the Cross.